A draft Village Design Statement (VDS), for Theydon Bois was published in summer 2011. Comments were invited from all interested parties including the local district authority, Epping Forest District Council (EFDC). Final comments were requested by 1st October 2011. Comments have been received and in most cases incorporated into the text of the document. As a result of this exercise, the first edition of the VDS statement was formally issued in June 2012. In August 2015 a short Addendum was added added to the statement as a seperate pdf. The document is intended to be used as a reference by planners and designers. The Village Design Statement enables local people to have a say over what developments take place in their community. It provides design guidance to influence change and improve the physical qualities of the area. The Village Design Statement for Theydon Bois was prepared with the advice and financial assistance of the Rural Community Council of Essex who provided us with the procedural steps for preparing the statement. That procedure included collecting data from the village population through a questionnaire and a photo shoot of what they felt were important to the fabric of the village.The process involved asking the community to identify what is special, unique and distinctive about the character of the parish. To aid the process of raising public awareness, included explaining and publicising the work of preparing the statement and inviting public comment, we set up stalls at two of the annual village events, the Donkey Derby and Horticultural Show. Local communities have a unique appreciation and understanding of their own community and a VDS is based upon this knowledge. It describes the qualities that residents value in their village and its surroundings. Around 200 communities have completed Design Statements to date. A Village Design Statement sets out clear and simple guidance for the design of all development in the village, based upon its character. It is an advisory document produced by the village community, not by the planning authority. However, the District Council have added the VDS to the evidence base for the new Local Plan. The First Edition of the Theydon Bois Village Design Statement has been well received by both public and local officials. Without any doubt, we could not have produced this informative document without the invaluable help and guidance of the Rural Community Council of Essex and their officers, particularly Chris Hobbs. The Rural Community Council also provided the bulk of the finance to enable this project to proceed for which we thank them but we would also like to thank those local clubs, societies and associations which generously responded to the call for sponsorship. We also like to thank all members of the community who gave of their time in providing material and contributed their comments and which formed the basis of the information from which the Village Design Statement has been written. Finally, I would like to pay a tribute to my fellow committee members who have committed untold hours of their time and have exhibited unstinting enthusiasm in pursuit of a successful conclusion of the VDS project. 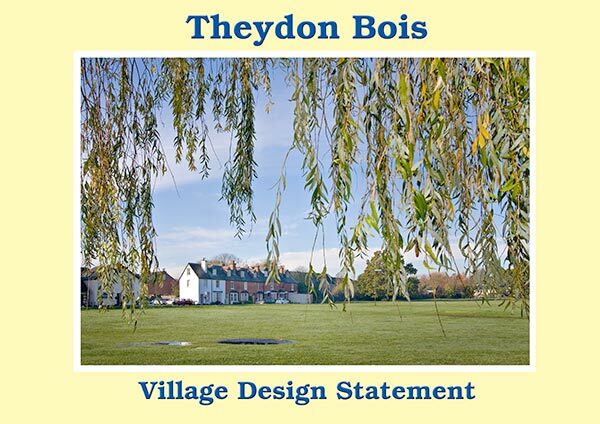 At present the Theydon Bois Village Design Statement can be downloaded as a pdf version (below) or hard copies are available for viewing and loan from the Parish Office. After EFDC have completed their Local Development Framework the Village Design Association will consider if any revisions are needed to this June 2012 version of our Village Design Statement. Many people feel that they have no say over what development takes place in their community; but Village Design Statements (VDSs) offer a constructive solution to this dilemma. Local communities have an unique appreciation and understanding of their own place, and a VDS is based on this knowledge. It describes the qualities that residents value in their village and its surroundings. Around 200 English communities have completed Design Statements to date. A Village Design Statement sets out clear and simple guidance for the design of all development in a village, based on its character. It is an advisory document produced by the village community, not by the planning authority. It will not stop change from happening, but it can help effect how any new building fits in to the village. VDSs are intended to influence the operation of the statutory planning system, so that new development is in harmony with its setting and makes a positive contribution to the immediate environment. What does a VDS cover? • Production of a Statement fosters working in partnership with the local authority, engenders understanding of current planning policies, and offers the chance to influence future policies. • is about managing change in the village, not preventing it. A Village Design Statement is unlike any other planning document. It gives planning advice directly applicable to the statutory planning system and is entirely community based.